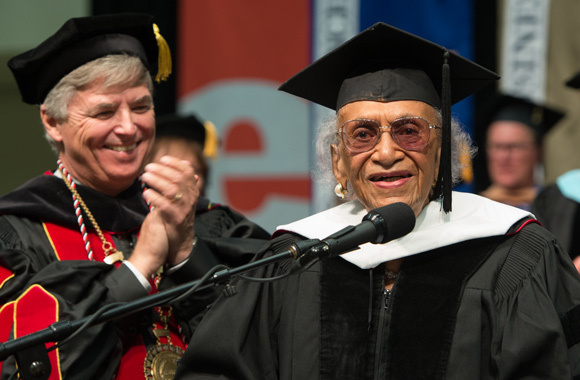 Frankie Muse Freeman was awarded an Honorary Doctor of Humane Letters during the May 5 commencement ceremony. Freeman has spent her lengthy career advocating for civil rights issues that have had a lasting impact at the local, regional and national levels. In 2007, Freeman was inducted into the International Civil Rights Walk of Fame for her leadership role in the civil rights movement. In 2011, she received the National NAACP’s highest honor, the Spingarn Medal for outstanding achievement by an African American. Freeman earned a law degree from Howard University Law School in 1947 and practiced law in state and federal courts for more than 60 years, retiring in 2009. In 1954, she was the lead attorney for the landmark NAACP case Davis et al vs. the St. Louis Housing Authority that ended legal racial discrimination in public housing in St. Louis. In 1964, she was nominated by President Lyndon Johnson as the first woman member of the United States Commission on Civil Rights, a bipartisan commission with the responsibility of investigating, reporting and making recommendations on civil rights issues. She served for 16 years for four presidents. President Barack Obama appointed her as Commissioner of the Commission on Presidential Scholars in 2015. Freeman’s many honors include induction into the National Bar Association’s Hall of Fame in 1990, induction into the Civil Rights Hall of Fame and recipient of a St. Louis Walk of Fame star. The St. Louis City NAACP has commissioned a statue of Frankie Muse Freeman that has been gifted to the City of St. Louis and is to be installed in Kiener Plaza, close to the Gateway Arch.